In July of 1990 I found a pattern on one of the 10 daylight "Kecksberg" type UFOs that I accidentally photographed while hiking with 2 friends in the backwoods of San Diego. I later found that same pattern in numerous other UFO photos as well as on the Nazca Lines in Peru and countless ancient Indian rock paintings as well as artifacts from around the world winning front page coverage in every newspaper in town and an award winning CBS interview. My website and Youtube video documents this rare and historic discovery, I hope you find some time to explore my links at the bottom of this page. With so many celebrities going public with their belief in aliens and UFOs...and all the major networks producing detailed programs on this popular global subject...I thought you might like to see what many experts consider to be the leading edge in Ufology....my discovery of a pattern linking UFOs to each other as well as countless ancient artifacts. Here in San Diego this discovery is reigniting interest in the UFO phenomenon. My accidental photo of 10 daylight UFOs has produced the key to successfully link UFOs to each other as well as ancient artifacts and the Nazca Lines in Peru...a first in the history of Ufology. The Los Angeles Times broke the story and labeled the evidence "UNSETTLING"
"Just what will constitute proof of UFOs? 1. Clear, sharp photographs that can be scientifically verified and which show sufficient detail so that they could not possibly be of anything terrestrial." Well my accidental 35mm photo of 10 daylight UFOs has been examined and authenticated by numerous experts and was so detailed that the objects were identified as "Kecksberg" type UFOs with one of them having a spike-like projection visible in 5 other UFO photos as well as countless ancient artifacts. Advances in science and archaeology don't always come from the most educated. It was a sheep herder boy who discovered the Dead Sea Scrolls. Pasteur said "Fortune favors the prepared mind" which is exactly what my early research into metaphysics did for me. So when I accidentally photographed 10 UFOs in the backwoods of San Diego I was ready to investigate and not dismiss the possibilities. I wanted to forward to you news of my discovery of a lost alien code that proves that not only do aliens and UFOs exist but that they have had mankind's best interests at heart from the beginning. This lost sacred pattern has been found on artifacts from numerous ancient civilizations. My submission for national Geographic's $50,000 contest "Expedition Granted" was just posted on their website. Help me win the prize so I can create a professional documentary of my discovery of the "World's Largest Natural Rock Face" and how it's linked to the biggest UFO event of all time. "I was bold in the pursuit of knowledge, never fearing to follow truth and reason to whatever results they led." Why are aliens and UFOs showing up in vast numbers across the globe? Here is one possible reason. The 1908 Siberian blast, which altered our magnetic field, as postulated by Coral Lorenzen in her book, "Shadows of the Unknown" did that event actually postpone the shift of earths magnetic poles which science has proven is overdue by 230,000 yrs according to volcanic core samples? And has the location of the great pyramids in Giza around the belly of our planet as well as the magnetic field under Stonehenge stabilized our earths wobble and delayed the crustal displacement that a polar shift could surely activate much like in the movie "2012"?. Is this what the Mayans foresaw for 12/21/12 as the earth completed its 26,000 yr processional wobble cycle? Even the Bible has dire warnings of the effects of a crustal displacement of earths surface; Rev. Ch6 ;12-14 " and islands will disappear and every mountain moved from its place'.."an earthquake like none before". Now with the Sun about to reverse its polarity and climate change causing a huge displacement of heavy icebergs, will that be the straw that broke the camels back? NEWS UPDATE...from the "U-T San Diego Newspaper 12/23/13 "The melting of ice caps and glaciers because of climate change is causing a shift in the Earth's axis, according to new research. Wobbles in the planet's rotation are the result of influences including the distribution of mass. Observations conducted since 1899 have shown that the North Pole had been drifting south toward eastern Canada at a rate of 4 inches per year. But that drift jogged abruptly eastward in 2005 and has moved 4 feet since then". Edgar Cayce said the shift will happen "in the blink of an eye". Is this why sightings of UFOs have increased all over the world? Are aliens planning on evacuating mankind? Most recently 3 massive unexplained craters have opened up in Siberia. Are these connected to the upcoming shift? My accidental photo of 10 daylight UFOs, which I've named "The Inaja UFO Photo" after the Memorial Park where the photo was taken, exactly matches the acorn shaped object seen by numerous eye witness's in the famous "Kecksburg UFO" case. 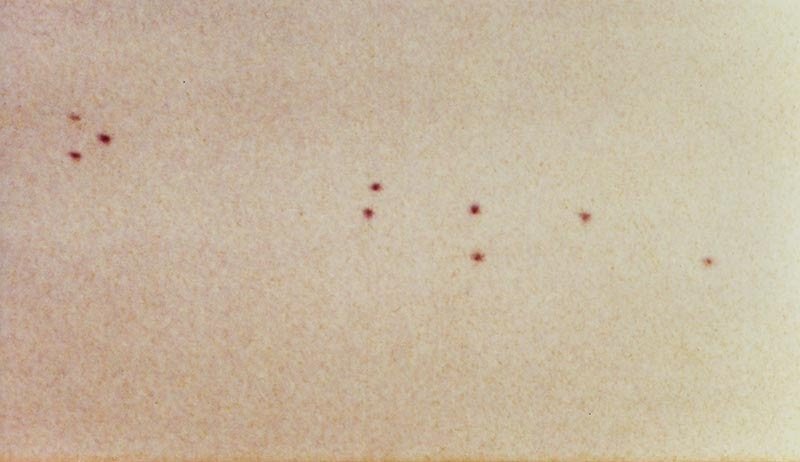 I have also discovered that the 3 bands surrounding that Kecksberg UFO as portrayed in the "Unsolved Mysteries" episode, duplicate the visible wavelength pattern of the hydrogen molecule with 2 bands close together and one farther apart. This same line pattern is seen in numerous ancient artifacts as seen on my website and was actually beamed into outer-space by SETI after I contacted them. A recent article by Michelle Nolan in the Bellingham Herald discussed UFOlogist Michael S.
"Inaja UFO Photo" was also featured for an entire year at the San Diego Air & Space Museums "The Science of Aliens" exhibit as real proof of the possibility of aliens and UFOs. The photo was first seen on ABC KGTV Channel 10 in the hands of Russia's famous test pilot Marina Popovich, who held it up during her interview with reporter Jim Wilkerson. I had the privilege of making 2 presentations to the delegations from Russia as noted in my front page Beach & Bay Press article. They were visibly impressed when I presented evidence that both our UFO photos duplicated markings on the desert floor at Nazca as seen in my website and YouTube video. This Was On http://ufodigest.com/article/lost-alien-code-rediscovered-1028 I take not credit i simply post good news.